This hand Towel is called a "tenugui". 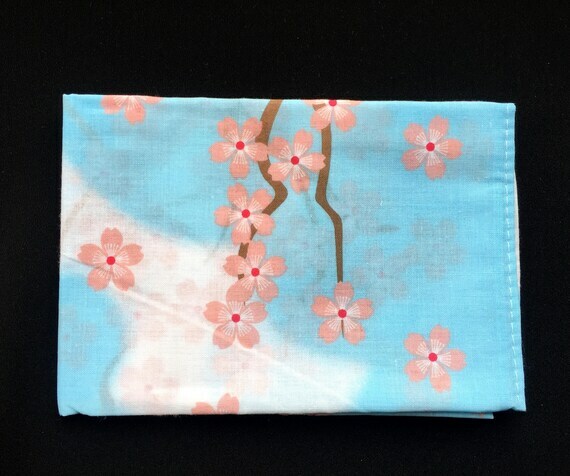 A Tenugui (手拭い) is a thin Japanese hand towel made of cotton. It is typically plain woven and is almost always dyed with some pattern. It can be used for anything a towel could be used for - as a washcloth, dishcloth, but often as a headband, souvenir or decoration. Towels made from terry cloth have replaced many of its use in the household. However tenugui are still popular as souvenirs, decorations, and as a head covering in kendo, where it functions as a sweatband, as extra padding beneath the headgear (men), and to identify the participants by team color. It is also often used as fabric and made into something else. It is 33 cm x 90 cm and is 100% cotton. It is gauze like. The edges are finished. We will combine shipping if you buy from any of our stores.